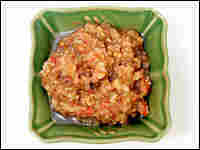 Zakuski: Mighty Russian Morsels Food blogger Deb Perelman is a self-described "girl with a short food attention span." When she first encountered the small, colorful dishes called zakuski, she says she was pretty sure she had died and gone to grazers' heaven. If you love grazing on lots of small plates but are tired of Spanish tapas, try the Russian version: zakuski. 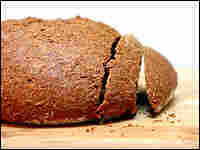 Get recipes for Russian black bread, Georgia kidney bean salad, eggplant caviar and salted mushrooms. Deb Perelman writes about food, technology and the daily grind in New York City. Her cooking blog, Smitten Kitchen, was the recipient of a 2006 Food Blog Award in the Humor category. The first time I was invited for dinner at my husband's family's house, I had no idea I was stepping into a veritable wonderland of new foods. Russian cuisine, I naively thought, was just cabbage, potatoes and vodka. While the meal lacked none of those ingredients, it had none of the dreariness I associated with them. Small, colorful dishes filled the table from one end to the other: smoked fish, caviar, cured meats, salads, cheeses, everything and anything pickled. It was all diced and lively, pierced with fresh garlic and swaddled in kicky vinegar. For a girl with a short food attention span, I was pretty sure I had died and gone to grazers' heaven. There is something fantastic about the way that Russians treat their guests. This spread of salads and small plates that wowed me — called zakuski (derived from the word morsel) — dates back to czars' tables of the 18th century. 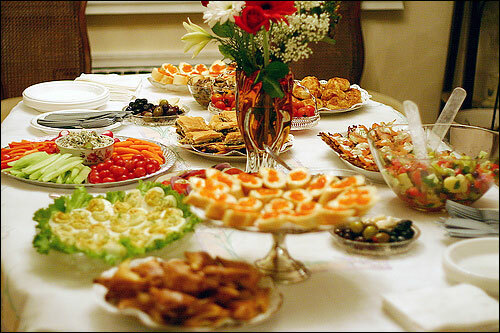 These Russian hors d'oeuvres were often served to standing guests outside the main dining room, usually buffet style or passed by waiters. 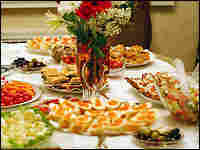 Salads, caviars, mushrooms, as well as various kinds of vodkas, were standards of the day. While this remains unchanged, a more modern approach is a mix of purchased smoked fish, caviar, hard cheeses and salamis, and a homemade bean salad, eggplant caviar, brined mushrooms, beets, tomatoes, watermelon, and bread or pastry pockets filled with meat, potato or cabbage. Always presented as "just some little bites," zakuski serve to welcome visitors from long journeys and take the edge off their hunger before a meal. "Come in," a full table says, "you are welcome in our home." And although it worked like a charm, in the months and years that have followed that first dinner — through a courtship, our wedding, two kitchens and hundreds of home-cooked meals — I had tried my hand at these dishes only once. From our shopping bags stuffed with leftovers after every meal at my in-laws' house to the salient fact that nobody cooks these foods better than my mother-in-law, I've been both too intimidated and too complacent. It was a recipe that finally drew me in. Someone slipped me a recipe for Russian black bread, one with such an incomprehensibly long ingredient list, my eyes widened and mind immediately began ticking. I found the implied challenge irresistible. On a recent Saturday morning, I plunged in, measuring out molasses and vinegar, coffee and shallots, among other odd ingredients. Six hours later, the aroma and suspense were too much to bear, and we sliced into a still-warm loaf of the most flavorful, dense and soul-warming bread ever to grace my kitchen. Over dinner at my in-laws that night, people who usually shy away from excesses of carbohydrates slathered piece after piece with butter and caviar until the basket had to be refilled. "You can freeze the leftovers, to preserve the best flavor," I suggested. "Oh, that will not be necessary," I was assured. Brimming with pride that I'd made Russian food that had impressed real, actual Russians, this act of bravery has inspired more. I've tackled my mother-in-law's famous eggplant caviar, and even make two other standard zakuski, salted mushrooms and a Georgian kidney bean salad. Set out another dozen dishes, some caviar and ice-cold vodka, and we'll be right over. Read last week's Kitchen Window: beans and cornbread. Get more recipe ideas from the Kitchen Window archive. I am struggling to say anything objective about this bread, because it is, hands down, the best I have ever baked and possibly ever eaten; in a few weeks, we've made it halfway through our second batch. It is adapted from The Bread Bible by Beth Hensperger (Chronicle Books 1998). Don't be put off by the 20 ingredients; it makes for an abundantly complex, hearty and flavorful bread. To eat it as the Russians do, slather it with a layer of salted butter and caviar. At low speed, add half cup of remaining mixed flours at a time, until dough clears sides of bowl and begins to work its way up paddle. It will be very sticky but firm. Scrape dough off paddle, gradually add flour mixture, and knead to make a springy yet dense dough. You might not use all of the flour mixture. Form into a ball and place in a greased bowl. Turn once to grease top. Cover with plastic wrap and let rise in a warm area until doubled, about 1 1/2 to 2 hours. Combine cornmeal, flour and remaining caraway seeds and set aside. Gently deflate dough. Turn out onto a lightly floured surface. Divide into two portions and form into two rounds. Place seam down on a greased or parchment-lined baking sheet, sprinkled with cornmeal mixture. Cover loosely with plastic wrap. Let rise until doubled and puffy, about 45 minutes to one hour. Slash an X into the top. Bake in a preheated 350-degree oven for 50 minutes or until loaves are well-browned, or register an internal temperature of 200 to 210 degrees on an instant-read thermometer. Remove from baking sheet to cool completely on a rack. If you think that you don't like either cilantro or assertively spicy food, this salad could change your mind, as it did mine. The flavors play off each other, creating a dish even better than the sum of its parts. Like any recipe that's been passed down through generations, there are many different versions of this, some with plum jam, pomegranate juice and seeds, ground coriander, marigold, cinnamon, or all of the above, but I just make it the way my mother-in-law does — crunchy, spicy and tangy. 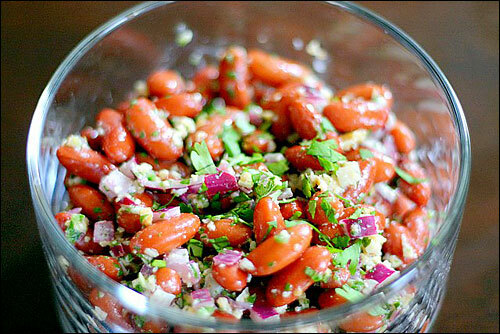 Whisk first seven ingredients in a bowl, stir in kidney beans and season to taste. The Joy of Cooking explains that this dish is from the Caucasus, originally created as a tasty substitute for those who could not afford the luxury of real caviar, but versions exist today everywhere from Russia to Greece. Not for the faint of heart, this spread has an assertive garlic-and-vinegar flavor that may at first seem off-putting, but quickly becomes addictive. This is my mother-in-law's recipe, and she is never allowed to show up without it. Preheat oven to 350 degrees. Prick the eggplant all over with a fork, and roast on a foil-lined baking sheet for 30 to 45 minutes, until soft. Make a few slashes in the bottom of the eggplant, and drain it in a colander for about 20 minutes. Cool completely. Cut eggplant open and scrape out flesh and seeds with a fork onto a cutting board, discarding the skin. With a large knife, chop the eggplant flesh into very small bits. (Unfortunately, the food processor, although speedier, only purees the eggplant, leaving little texture.) Scrape into a medium bowl. In a food processor, puree the tomato with garlic. 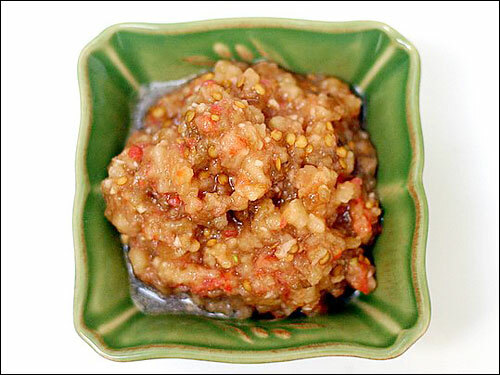 Pour puree into bowl with chopped eggplant, add the salt, black pepper, vinegar and vegetable oil. Adjust seasonings to taste. Mushrooms were once preserved this way to keep them for months or even years, but now we just do it because they're delicious, whether eaten alone or sliced into a salad. For a more distinct flavor, try using wild mushrooms. This recipe is adapted from The Joy of Cooking by Irma Rombauer, Marion Rombauer Becker and Ethan Becker (Scribner 1997). Wipe clean and trim mushrooms. Trim, rinse and divide dill in half. Have ready a clean two-quart crock or glass jar. Coarsely chop half the dill with the garlic. 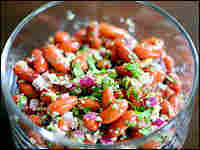 Sprinkle a portion of the remaining dill in the bottom of the crock or jar. Top with a layer of mushrooms, stem side up. 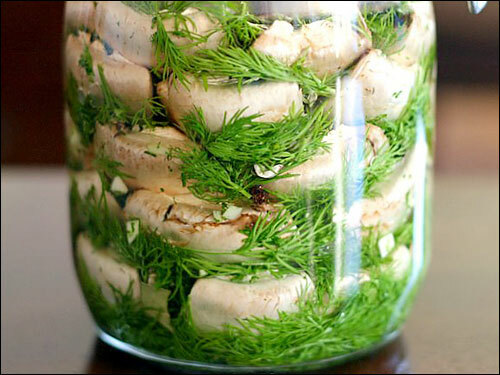 Combine bay leaves and peppercorns, and sprinkle a portion of that mixture, a portion of the dill-and-garlic mixture, and a portion of the remaining fresh dill over the mushrooms. Continue layering in this fashion until all the mushrooms have been used. Stir together water and salt. Pour the salted water over the mushrooms, cover with a small plate, and weight the plate with a heavy can to make sure the mushrooms are not exposed to air. Let stand at cool room temperature for 48 hours, then transfer to the refrigerator. 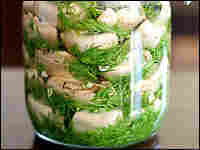 The mushrooms will be ready to eat in 2 to 3 days and can be kept, covered and refrigerated, for up to 1 month.